"Implementing a Proactive Chat System"
Implementing a Proactive Chat System gives us a fast, direct and uncomplicated experience– that’s what the experience should be like when customers contact companies. In today’s global economy, businesses are doing all they can do to stay relevant with the expanding technology in an attempt to reach more customers. Customer support over the phone is no longer a preferred method of communication, encouraging issues such as shopping cart abandonment and low average order values, rather than preventing them. 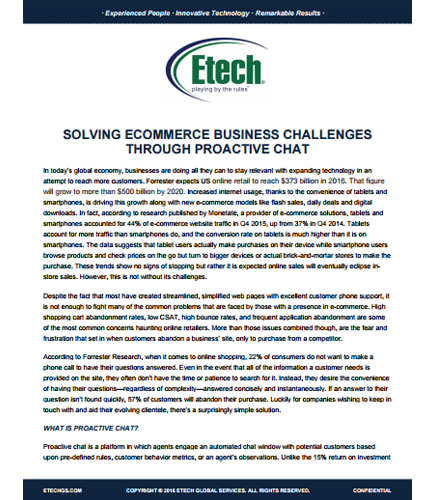 The simple, yet highly effective solution lies within the application of proactive chat. Proactive chat is proactively trying to help the customer when the probability of the customer leaving the site is high. How to implement proactive chat the right way? What are the best practices to implement proactive chat? How to increase lead conversion with proactive chat and what are its best practices? What are the things that should be considered when implementing chat?